Massachusetts is the only state that has agreed to send mass mailings to register welfare recipients to vote, following a series of state lawsuits brought by the liberal group Demos, which is chaired by the daughter of Democratic Senate candidate Elizabeth Warren. Republicans say the mass mailings indicate that Massachusetts went above and beyond what was necessary to turn out likely Democratic voters for the November election. Other states have settled Demos’s lawsuits by agreeing to less costly steps, such as better training for welfare officials or upgraded computer systems. But Demos says it pushed Massachusetts to mail the voter registration forms to thousands of welfare recipients because the lawsuit here was filed so close to the election that simply allowing recipients to register the next time they went to a public assistance office was not practical. The voter registration drive has erupted as a sharp point of contention in the race between Warren and Senator Scott Brown, a Republican. Massachusetts is taking steps to do what it is required by law to do — encourage voter participation, including through public-aid agencies. Brown argues that the effort was a ploy to boost Warren’s campaign at the behest of Demos, a New York advocacy group of which daughter, Amelia Warren Tyagi, serves as chairwoman of the board. Demos officials maintain that the effort has nothing to do with Warren’s campaign. They say they have sued nine states as part of a national campaign to enforce federal voter registration laws that began in 2004, well before Tyagi joined the board in 2006. The group initiated its lawsuit against Massachusetts in December 2011 — three months after Warren entered the Senate race — and formally filed the suit in May. The state agreed to Demos’s demands last month, rather than face an Aug. 17 court date. Demos said it brought the lawsuit after finding that Massachusetts was not actively offering welfare recipients the opportunity to register vote, as required by the National Voter Registration Act of 1993. That law, also known as the motor voter law, requires states to provide voter registration materials at certain government offices, including public aid agencies and military recruiting stations. “It would be irresponsible of us, from my perspective, to avoid Massachusetts simply because a family member of a board member was running for office when we saw the problems,” said Lisa J. Danetz, a senior counsel at Demos. She, like a number of Demos officials and board members, has donated money to Warren and other Massachusetts Democrats. Danetz said Tyagi played no role in the lawsuit, despite her position on the board. Board members are not involved with day-to-day decisions, which are handled by the staff and the president, who is chosen by the board, said Lauren Strayer, a Demos spokeswoman. The board meets about three times a year to choose the president, provide strategic advice, and approve the annual budget, Strayer said. 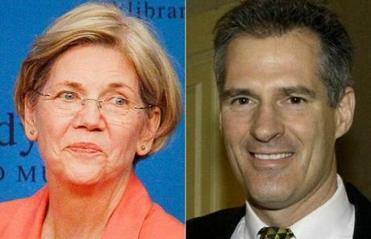 The mailings to register voters has become a point of contention between Elizabeth Warren and Scott Brown. Tyagi, 40, lives in California and wrote two books on the middle class — “The Two-Income Trap” and “All Your Worth” — with her mother, a Harvard Law School professor and consumer advocate. Demos bills itself as a nonpartisan public policy group but is known for its liberal views. It receives financial support from George Soros, the billionaire financier and major backer of Democratic candidates. At least four members of the Demos board have contributed to Warren’s campaign. Warren herself was honored, along with talk show host Tavis Smiley and AFL-CIO official Elizabeth Shuler, at Demos’s 10th anniversary gala in New York in May 2010. Demos was saluting Warren’s work as head of the committee overseeing the federal bank bailout. Demos has not lost a case against against any of the nine states it has sued for failing to register welfare recipients to vote. Five states have settled and four, including Massachusetts, face ongoing litigation. Demos has sent letters to four more warning they may be sued if they do not take steps to comply with federal law. In Massachusetts, the only reason welfare officials said they agreed to send voter registration forms and prepaid return envelopes to 478,000 welfare recipients was to comply with federal law. The cost of the mass mailing was $276,000. Such mailings are not without precedent. Danetz said Demos got the idea for them from a case in Michigan, which agreed to send voter registration forms to settle a lawsuit brought by another voting rights group in the 1990s. The state Republican Party, meanwhile, filed a public information request demanding e-mails relating to the lawsuit that were sent between the Warren campaign, the Patrick administration, and the secretary of state’s office. History shows that poorer voters tend to vote Democratic. The majority of voters in the bottom fifth of the income scale have voted for the Democrat in every presidential election but one since 1960, according to American National Election Studies, a collaboration of Stanford University and the University of Michigan. Barbara Norrander, a political scientist at the University of Arizona, said when Congress was debating the National Voter Registration Act in the early 1990s, that disparity led to a partisan impasse over where states would supply voter registration materials. Republicans wanted them in military recruiting stations, Democrats in social services offices, she said. As a state legislator, Brown was a leading supporter of efforts to require voters to show identification at the polls. He and other Republicans argued that the requirement would ensure the integrity of the vote. Democrats contended that the bills were an attempt to disenfranchise minorities and the poor.